I usually love long hair, but this short hairstyle of yours is amazingly cute. About as cute as your smile. Red, white, and blue have never looked so stylish. Nice outfit! Is this a new 'do? I love it!! Also the Celine is fab. And I love this outfit. Simple but chic! Cute! This outfit reminds me of a preppy school girl look. Your hair is fab! I WANT YOUR BAG!! <3 Love the look Khatu! 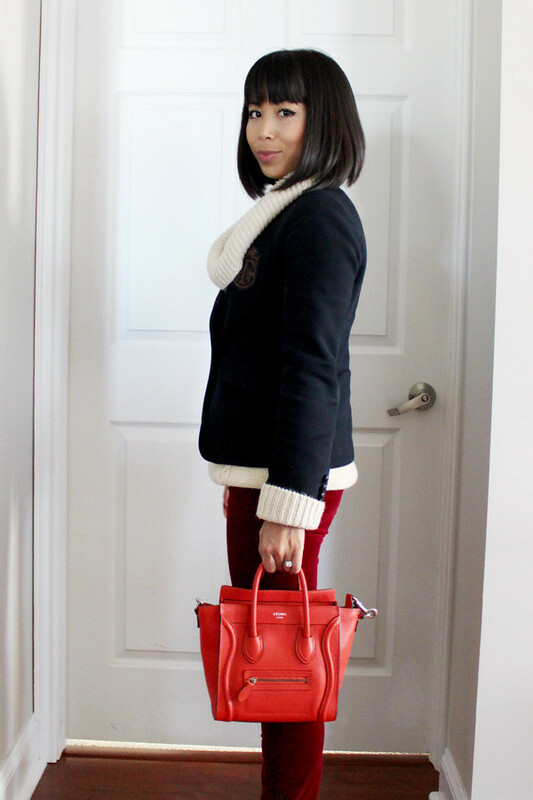 loving your mini celine & the ox blood cords! the fringe doesn't suit your face. you look better with a side fringe. Your hair is so upstaging your outfit right now, it is so cute! oh my god! i love your hair! Love the clash of reds! What made you go for the Nano as opposed to other sizes? Have I mentioned how much I adore your new hair?! I want my hair to do this, alas, I know it will not. It is perfection!! @Joanna Le because I love a good crossbody bag. I like that I can wear it two ways.